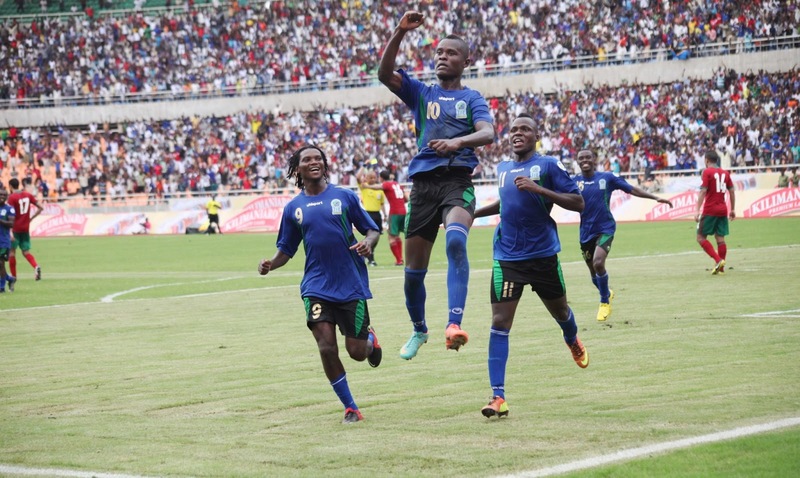 Mbwana Samata celebrating his second goal of the game, Tanzania’s third in their 3-1 win. Mere hope has metamorphosed into belief. 1-0 wins over the 2012 Cup of Nations champions Zambia and Cameroon in December 2012 and February 2013, respectively, had acted as the prelude with many subsequently sitting regally when the Tanzania national team was mentioned. But those were friendlies; nothing more than boisterous Bunsen burner experiments that were not fool proof. Zambia had fielded experimental XIs in each half in preparation for the Africa Cup of Nations and have been slayed enough to suggest that they’re not giants but potential one-hit wonders. Cameroon, meanwhile, are undergoing a nadir and are masquerading as 35-year-olds who no longer want to play together; the Indomitable Lions are domitable. Tanzania, the sixth most populous country in Africa with a population of roughly 44 million, have been mired in footballing mediocrity since their appearance at the 1980 Cup of Nations, failing to qualify for a major tournament ever since. On Sunday, a splendid 3-1 win over Morocco served as the competitive inauguration of this Tanzanian team. The victory, the first over Morocco, means the Taifa Stars remain second in the in Group C, one adrift of group leaders Ivory Coast and four ahead of Morocco. The Tanzanian national team is growing before my own eyes and I’m starting to believe in it. Under the tutelage of Danish coach Kim Poulsen, a man who possesses erudite insight into Tanzanian youth set-up after his previous job as coach of the U-20 and U-17 sides, there has been focus on integrating youth into the senior side. The growing sense of unity is palpable, the collective cohesive raison d’etre – aided by players largely plucked from Tanzanian behemoths Simba and Young Africans – encapsulated in the intrepid manner they toyed with the Atlas Lions at times. Whilst West African nations have been able to combine power and technique to overcome Maghrebi nations (and dominate African football), East Africans, of smaller stature, generally less technically-accomplished and more suited to the rigours of long-distance running, have seldom been able to outplay Maghrebi nations; victories have come via gossamer-thin, seat-squirming margins. The greatness of this performance by Tanzania, who recorded their biggest win ever over a North African team, was that it was imbued with technicality that is finally becoming cherished in East Africa. Whisper it: Tanzania, with a talented, experienced nucleus of players aged 23 or under, are on the path towards something special. Of course, with mass population come great expectations. Tanzanians are no different in that respect, but an accustoming to mediocrity had rendered to apathy towards international football during their 31-year longueur. They want the world – qualification for the 2015 Afcon would be enough, and that is Poulsen’s target – or nothing. It was apt, then, that 19-year-old Thomas Ulimwengu [Ulimwengu means ‘the world’ in Swahili] would prove to be the inspired half-time substitution in this World Cup qualifier. Dar es Salaam is a tough place to go – I know this because I was born there. It may seem counter-intuitive, perhaps a shtick; after all, the name Dar es Salaam is derived from Arabic, meaning a safe port. If Morocco had come to Dar es Salaam for an idyllic cup of tea in the sub-sahara, then Ulimwengu was the wide-eyed raver keen to throw a spanner in the works. Within forty seconds after trotting on for Mwinyi Kazimoto [Kazimoto means ‘hot work’ in Swahili], he had put the Taifa Stars in front after a mammoth throw-in had caused mayhem in the Moroccan box. Kazimoto may have been warming the bench in every sense of the phrase but he had obviously transmitted his heat to the quicksilver Ulimwengu who seemed on an incessant quest to add layers of perspiration to the Moroccan backline. His fraternal understanding with talisman Mbwana Samata formed from club incursions with continental heavyweights TP Mazembe came to the fore. For the second goal, Ulimwengu drew a Moroccan defender out of his position before leaving the pass for Samata to run onto and finish low past Nadir Lamyaghri with dead-eye accuracy. Then he sealed it by hurrying Chakir into a tumble before squaring to Samata to do the rest. The overwhelming thing about it all was that there was trust; a coming-of-age, if you will. Even the most cynical football fan reaches a point where they trust their team not to balls it up. Morocco’s penchant for pressing the self-destruct button undoubtedly added logic into my train of thought, but even if one considers that I remained pretty phlegmatic at 1-0. Salum ‘Sure Boy’ Abubakar displayed the origins of his moniker with his yogic calmness on the ball, Amri Kiemba wasn’t far behind in the poise stakes, the forceful forays of Shomari Kapombe provided relief, and the pace down the flanks mixed with Samata’s finishing reassured me the rest would be history. The defensive, helped by the profligacy of Morocco in front of goal, rode their luck, but sometimes you have to; goalkeeper Juma Kaseja made some stunning saves, enough to forgive him for his mishap deep in injury time to gift Morocco a consolation goal. Tougher tests are yet to come. The double-header in June, away to Morocco and then at home to ruthless efficient qualifiers Ivory Coast, will chart at which point of their upward curve this young team is stationed at. Realistically, it’s hard to foresee Tanzania qualifying for the World Cup but the seeds are being planted for 2015 Afcon qualification. The fact that they’re doing what good teams should be doing – winning home games, insofar that they’re considered bankers – is enough to leave Tanzanians stargazing at the Taifa Stars. Massive article as usual ! Keep it on guys you’re doing amazing stuff ! Thanks for the kind words Lotfi, your support is always appreciated. We loose every week, you’re nothing special, we loose every week. I like your article and your enthousiasm, but you’re “just happy” 😉 not fair. Of course, tougher tests are to come, but Tanzania lost 1-0 at home to Morocco in 2010 so this marks an improvement – and it’s not a one-off as results against Zambia and Cameroon have shown. A nice read,well articulated and backed with good background information.However there are some minor inaccurracies to be rectified.Tanzania won 1-0 against Zambia.And Ulimwengu can be translated as The Universe not the The World which is known as Dunia in Swahili…Good job,an enjoyable article. Thanks for the kind words, Michael. Edited the minor scoreline error, the meaning of Ulimwengu seems to flicker between The Universe and The World based on what you consult. What a great article. Asante sana for the kind words. Asante sana for reading, Thomas. Is this the real Thomas Ulimwengu?